Will the market break or will the market hold? The Markets are now sitting smack on their supports. Now its time for them to decide. 1. 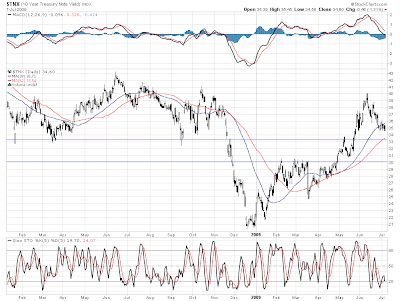 Treasury’s rate rising signals, IMO, an increase tolerance to risk and benefits the stock market. At the moment this does not appear to be the situation. Looks like the yield wants to settle at 3.35 or so. However, it could bounce from there. 3. Volatility is declining. Although the VIX has been up the past few days, it is still in a negative and declining trend. And barring a catalyst I do not see it breaching the current trend, let alone reaching the mid 3os. 4. The financial media has become blindly bullish. This is no more. LOL. They are following the pack. 5. Perceived stability within the financials. Stability with the financials is no longer a question, and with potential write ups do to mortgage modifications, financials can be potential leaders. 6. Global trade stability via the Baltic Dry Index. With all the negative talk recently, the BDI has been very stable, and rose pretty nicely in June. This is a true indication to global trade, and speaks to goods being moved, which makes me question certain negativity. What will happen is ultimately any one's guess, but individual names are not pricey with the market at current levels. Now taking the above reasons into account, we have a very real reason to purchase stocks if they get too low in price. If the markets break the current support, we will have this. The only caveat that will merit a lower market and individual stock prices will be the uncertainty that Cali/US Gov. will create if they have to go to a showdown. Uncertainty reduces values, hence provides a fundamental reason to a decline. Basically, if we break down... I will be a buyer.